You’ve heard the song many times on the radio, on a recording, or performed in a Christmas church service. You may know it as simply the Hallelujah Chorus with its dramatic, stirring, and very catchy tune. It’s difficult to sing, but a moving experience to do so with a large choir and congregation to help you. It’s a song I heard often when young, but didn’t fully appreciate musically until later in life. I came to have awesome reverence for it over time as I learned the full back-story of its composition. We know it as Handel’s Messiah, one of those famous classical pieces. It’s actually one of the world’s most beautiful musical scores ever written. It changed a man’s life and its creation reveals a glimpse of the glory behind the creative aspect of God. George Frideric Handel was born in 1683 in Germany. His father was a surgeon, his mother was the daughter of a pastor. He grew up in affluence and with a classical education. While showing a strong interest in music at a very young age, his father determined that his son was to be a lawyer. In fact, his father forbade him to have anything to do with music, even going so far as to burn all the musical instruments in the house. It was a wise, sympathetic relative, however, who secretly gave young Handel access to a clavichord away from his father’s hearing, and Handel taught himself to play. At the age of 6, when accompanying his father to a royal gathering, Handel went up and played the organ after a Sunday worship service. Upon hearing the youngster playing, a duke was so impressed that he urged the father to give his son a formal music education. As a result, Handel was allowed to study the organ. He mastered composing for the organ, oboe, and the violin by the time he was 10 years old. From the age of 11 to the time he was 16 or 17 years old, Handel composed church cantatas and chamber music that, being written for a small audience, failed to garner much attention and have since been lost to time. Out of respect for his father’s wishes, Handel studied law at the University of Halle in 1702. Soon, however, he switched his concentration solely to music. Moving to England in 1712 after composing a breakthrough opera (Rinaldo) which brought him critical acclaim and widespread recognition, Handel struggled to make a living as a composer and musician. He fell in and out of favor with benefactors as he competed with other English composers. He then focused on writing oratorios, large scale concert pieces, which were becoming popular and performed in secular theaters. But by 1741 his health began to fail and he was facing debtor’s prison. Then two events turned Handel’s life around: 1) a friend gave him opera text on the life of Christ, with the words taken straight from the Bible, and 2) three Dublin charities commissioned him to compose a work for a fund-raising benefit. On August 22, 1741, Handel sat down to begin composing. He became so absorbed in his work that he barely took time to eat. 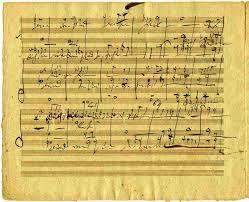 On September 14, 1741, he finished his composition and named it simply Messiah. In just 24 days he had written 260 pages of music. Considering the short time involved, it is considered the greatest feat in the history of musical composition. The premier performance of Messiah was April 13, 1742 in Dublin. The performance freed 142 persons from debtor’s prison. A year later it was performed for the first time in London with the king in attendance. As the choir began to sing the “Hallelujah Chorus” the king rose to his feet and the whole audience followed his lead, beginning a tradition that continues to this day. It is interesting how special gifts and talents are given to man, sometimes revealed when young, oftentimes discovered over time. We do best when these gifts are returned back to God in surrendering release. He does amazing things through His people who submit and let go. What work is God composing with your life?